On Friday, June 8, Joe DeGuardia’s Star Boxing turns back the clock, with the 31st edition of Rockin’ Fights at The Paramount. Headlining the event in a junior welterweight tilt, will be local hero’s, Long Island’s own, ANTHONY “SHOWTIME” KARPERIS (15-3 5KO’s) against Queens native, DANNY “EL GALLO” GONZALEZ (15-1-1 6KO’s) in a “Battle For The Paramount”. 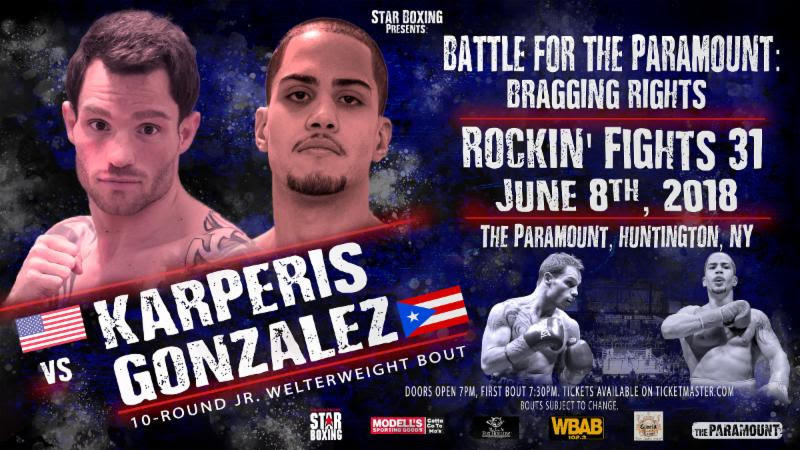 Both Karperis and Gonzalez are no strangers to the Rockin’ Fights series at The Paramount. Karperis returns for his fifth consecutive Rockin’ Fights main event, coming out victorious in his last opportunity, against tough Nicaraguan, Nelson Lara. This will be Karperis’ seventeenth fight at The Paramount going back to 2012. During his tenure at the great Long Island venue, Karperis earned himself the New York State Super Lightweight Title in 2016. Gonzalez will step into the ring in June, looking to remain undefeated at his home away from home. A victory would make it eight consecutive wins at The Paramount, the last coming in March against Juan de la cruz Rodriguez by way of TKO. This will be the first headliner for Gonzalez. Karperis is known for his agility and hand speed, creating angles to break down his opponents. “Showtime” has proven to use this agility to his advantage, taking down the likes of prospects Scott Burrell, Ariel Duran and fellow Long Islander, Alan Gotay. Gonzalez is a true New York boxer, who is not afraid to slug it out. Continuing his busy year, this will be Gonzalez’s fourth fight in as much time, previously taking out the likes of Samuel Amoako and Jerome Rodriguez. “El Gallo” knows a win at The Paramount will help him take the next step in his career. “Rockin’ Fights 31” brings together two New York based fighters, in a “Battle For The Paramount.” The arena in which both men have gone to war, time and time again. However this time, on June 8th, only one can be crowned the true king of The Paramount. Long Island’s own, ANTHONY “SHOWTIME” KARPERIS returns to The Paramount for his fifth consecutive main event, against Queens native, DANNY “EL GALLO” GONZALEZ looking for his eighth consecutive win at The Paramount. On June 8th, both men will enter the ring, but only one can win the battle for The Paramount.